Regripping: We have a large selection of different styles of grips to choose from, and we usually have them ready the next day. Reshafting: We carry many different styles of shafts and if we don’t have what you need we can get it within a day or two. 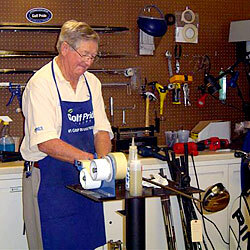 Loft/Lie Adjustments: We have the ability to retrofit your current clubs lofts and lies to make them better suited for your swing. Shaft Extensions and Cut Downs: We also can adjust the length of your clubs to make them longer or shorter depending on your needs.